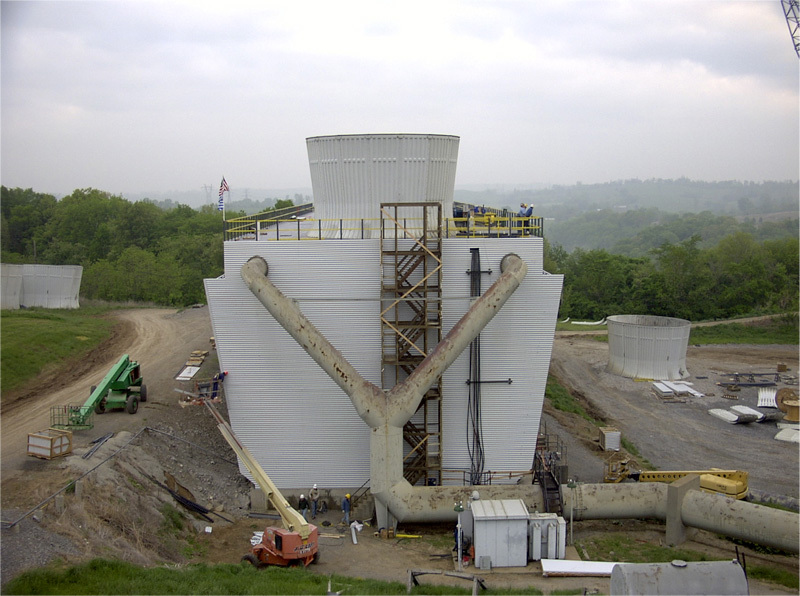 Precision Cooling Towers can custom design a Cooling Tower upgrade to fit your particular needs. Thermal (of or relating to heat) Upgrade (raise to a higher standard, in particular improve (equipment or machinery) by adding or replacing components). Thermal upgrades on cooling towers can consist of larger mechanical equipment, better distribution systems and/or more efficient heat transfer media. Some or all of these components can be utilized to best suit your needs. Cooling towers over time, get tired and inefficient; components begin to wear and lose performance. Examples can be worn fan blades, deteriorated drift eliminators or plugged fill media. That combined with increased demand put on the tower by new process equipment can drive the cold water temperature well above the original design. This occurs over time and can go unnoticed; until summertime conditions drive the cold water temperature up and your workhorse tower is no longer working for you. Now you are struggling to meet heat load demands with the result being reduced production rates or the expense of temporary towers to help carry the load. A thermal upgrade can bring your tower back to life; in most cases providing much greater capacity than its original design! With a Precision Configured Thermal Upgrade™, we will custom design an upgrade to fit your particular needs. We start with a free inspection of your tower to help identify any deficiencies. We combine this with your current or future heat load requirements and employ our unique thermal evaluation software to model a cost effective solution for you. That combined with quality components, competitive pricing and experienced installation crews will result in a finished upgrade that will more than meet your needs and expectations. You will then have a tower that will make you money instead of cost you money!